Beocord 1600 was to Beocord 1200 what the 2400 had been to the 1800, in as much as it included a built in stereo amplifier of 2x8W output. Other than this the two versions were very similar, though to make way for the twin volume controls (L & R) and the treble and bass controls, the recording level controls were simplified, and instead of having separate left and right controls for the microphone and line sources there was one ganged control for each. The line inputs had been re-classified as radio (as before) and phono. The phono input was still only a line input though, if one wanted to connect a B&O turntable with a magnetic pickup a preamplifier would be needed (e.g. Beogram 1200 with GF 4). 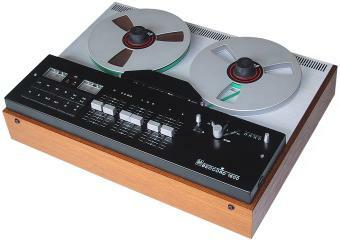 In this form one could build a record and tape based system similar to the 1200 system but without a radio. Beovox 1200 or 1001 would have been the suitable loudspeakers. Text copyright © Beocentral. Unauthorised reproduction prohibited. As with the Beocord 1200, the Beocord 1600 disappeared once the cassette became established. It was the last tape recorder with a built in amplifier that B&O would produce. Text copyright © Beocentral. Unauthorised reproduction prohibited.